A national network of campaigners have issued an Open Letter to all media, following today’s breaking national news of secret government plans accelerating the preparation process to replace our NHS with a private insurance-based health system. 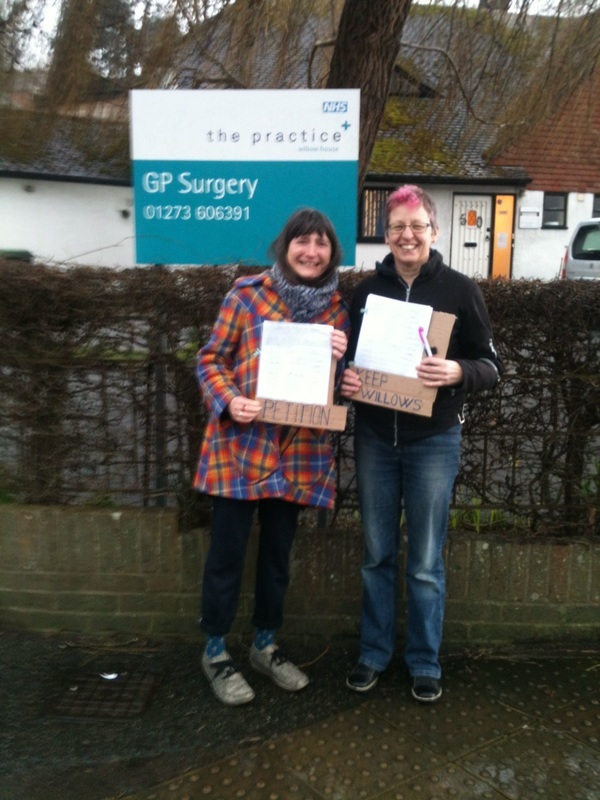 The Open Letter is signed here by Sussex Defend the NHS. A secret process to cut and further privatise the NHS is charging ahead across England. It goes under the name of Sustainability and Transformation Plans (STPs). We the undersigned think this is a disgraceful and destructive attack on public property and services and call for protests at our local authorities’ Health & Wellbeing Boards meetings, Clinical Commissioning Group meetings and at NHS England offices. Brighton & Hove and other local authority Health and Wellbeing Boards across Sussex are notionally responsible for seeing that STP governance and decision making processes “maintain democratic legitimacy”. How is this possible, when there is no statutory basis for “footprint” STPs - which are being drawn up by organisations operating without any formal governance process, beyond a Memorandum of Understanding which is of uncertain legal status? Councillors need to explain to the public how they can square their duty to represent and fully inform us, with their collusion in NHS England’s imposition of secrecy and dubious legality. STPs are highly political and highly contentious because they will commit us to huge cuts and NHS privatisation by a process of parcelling up the NHS into a new form of public/private partnership called Accountable Care Organisations - think PFI, but for services as well as buildings. All this is being carried out without ANY legislation to approve the transfer of NHS assets and services to these new forms of PFI. The outcome will be an NHS that offers reduced services, ends national terms and conditions for staff and is modelled on private American health insurance schemes. Under the new Sustainability and Transformation Plan, England has been divided into 44 ‘footprints’ which must make huge spending and service cuts and increase NHS privatisation in order to access “transformation” funds. Brighton & Hove is in Footprint No. 44, East Surrey and Sussex. The STP is a very large stick and a very small carrot, to impose cuts and privatisation on our already struggling health service. The so-called STP “financial reset” - snuck out by NHS England just after Parliament went on holiday, so with no parliamentary scrutiny - imposes new draconian funding cuts on hospital trusts. There has been no public statement of what these cuts will mean, in terms of staff and services. The STP “financial reset” has also driven newly cash-strapped Clinical Commissioning Groups to plan to withdraw various NHS treatments and to cherry pick patients for so-called Procedures of Limited Clinical Value (PLCV). According to the Royal College of Surgeons, PLCV means any elective procedures the CCGs don’t want to fund - even though they are recommended by NICE and have clear therapeutic value. The introduction via the STP of new “community care” models and contracts for GPs opens the door to privatisation of community and primary care - as is already happening elsewhere with companies like Virgin Care gobbling up community health & social care contracts and private companies taking over GP contracts. GPs' representative bodies, the Local Medical Committees, have complained about their exclusion from any consultation over the STPs in their areas. Sussex Defend the NHS first sent press notices about the Sustainability and Transformation Plans back in April and May. Copies are attached again. Today’s damning CQC report into standards at the Royal Sussex County Hospital in Brighton, placing the hospital in Special Measures is hardly surprising, say campaigners from Sussex Defend the NHS in Brighton. The campaign points to years of underfunding, under staffing, low staff morale, cases of racial and sexuality discrimination and serious disconnect between senior staff and front-line clinicians and nurses. A senior clinician at the Royal Sussex said that staff are working so hard despite government mishandling of reforms which have massively contributed to the crisis, underfunding as well as constant short-term changes at the top of the Trust. The list should include the effects of the government’s refusal to properly and safely modernise the junior doctors’ contract and the lack of effort by hospital management to support them. Katrina Miller for Sussex Defend the NHS said, ‘Here we are again with a senior manager, Gillian Fairfield, offering heartfelt apologies and little else. Just like with Patient Transport Services, another of these overpaid super managers who should properly acknowledge their own responsibility and the government‘s failure and resign. It’s on her watch we’ve seen a culture of blame, harrassment and bullying develop with understaffing, underpaid and overstretched doctors, nurses and support staff. These are significant failures of management against too high a number of indicators and she should go. You could think this is planned failure on the part of this government. What’s left of the national health service will be so bad, we’ll all rush off and buy private health insurance. And you can’t help but notice that in the massive and overdue development of the hospital which is being paid for by our taxes, a whole tower of new wards is only going to be available for private patients - Foundation Trusts are going to have to get nearly half of their funding from the private health sector as the government go on reducing their spend. The campaigners say the crisis comes along with those in GP services, Patient Transport and we are about to see Children’s Services going the same way. If you’ve had enough of all this and want to join the campaign, Sussex Defend the NHS stall will be at the Brunswick Festival this weekend in Brunswick Square, Brighton. Press Release on Investigation into Patient Transport Debacle in Sussex. Sussex Defend the NHS are angry at responses to the independent report on Sussex Patient Transport Service that was published on Monday. The local NHS campaigning group are calling for the resignation of Wendy Carberry, Chief Executive of Lewes and Havens CCG who is responsible for the contract being awarded to Coperforma and which led to a complete break down in the service earlier in the year. The chaos and dire consequences for patients caught the attention of the national press as well as local media. We have examined the initial reasons stated by Coperforma as being the two principal causes of the poor performance, (high volume of calls and errors in the live data transferred), and we suggest both should have been capable of being addressed in a number of days, rather than weeks. Blaming the previous provider is wholly inadequate and now proven wrong. It was weeks before Coperforma managed to improve the service to anywhere near acceptable levels. Even in June, Sussex Defend the NHS publicised the case of a patient who sadly died having missed an appointment with a consultant due to the transport not turning up. Wendy Carberry promised a report on this incident would be sent to the family by July. The group will be asking for its publication. Sussex Defend the NHS will be lobbying the city council’s Health & Wellbeing Board this coming Tuesday, 12th July. The public health cuts, agreed in March, will see the Health Visiting and School Nursing budget slashed by £1m with devastating effect on clients, young families, children at risk and the highly experienced and well qualified staff working with them. The Health & Wellbeing Board have also agreed to put the contract for these Children’s Health Services out to tender. It is believed one of the companies showing interest in the Brighton & Hove contract is Virgin Care, part of Richard Branson’s empire. Earlier this year Bristol campaigners were successful in halting the sale of their NHS-run Children’s Services to Virgin Care because the company pay no tax in the UK despite the company having been awarded NHS contracts worth over £1 billion over the past 6 years. Campaigners discovered the fact that Virgin Care, have ‘made no profit’ in the UK*. Research has unearthed the use of tax havens by Virgin Care and other private companies working with the NHS. The investigation found 13 holding companies, some of them offshore, between Virgin Care and its ultimate parent company, based in the British Virgin Islands, a tax haven**.This adverse publicity resulted in Virgin withdrawing from the Bristol tendering process. All press coverage gratefully received and we look forward to seeing as many of you as possible outside the Brighthelm for photo and interview opportunities! * Virgin Care has become a major player in the market for NHS services since it entered the healthcare market in 2010. Over the past five years the company has been awarded contracts worth over £1 billion, with several large contracts in community health. Virgin Care continues to be highly active in tendering for NHS contracts, despite the company showing no signs of a profit: since 2010 the company has recorded an annual loss of £9 to £10 million. As Virgin Care Ltd makes no profit in the UK, according to its accounts, the company pays no tax in the UK. However, Virgin Care Ltd is a small entity in Richard Branson’s Virgin empire. Virgin Care’s ultimate parent is Virgin Group Holdings registered in the tax haven of the British Virgin Islands. The ultimate owners of Virgin Care are trusts registered in the British Virgin Islands where no tax is paid whose beneficiaries are Richard Branson and his family. Questions have been raised over where exactly any of Virgin Care's profits would go and if tax would be paid on profits in the UK. ** Tax Avoidance Since 2010 when Virgin Care was formed the company has not reported a profit but a loss of around £9 to £10 million each financial year. No profit means no tax is paid in the UK. However, Virgin Care’s position within the complex structure of Richard Branson’s empire has raised some questions about tax liabilities. In March 2015, an investigation by Richard Murphy,a chartered accountant at Tax Research UK, highlighted the use of tax havens by Virgin Care and other private companies working with the NHS. The investigation found 13 holding companies, some of them offshore, between Virgin Care and its ultimate parent company, based in the British Virgin Islands, a tax haven. Murphy’s research also found that Virgin Care borrows money solely from a Virgin holding company and reports that it will repay that loan, which will be corporation tax-deductible, when a profit starts to be recorded. That holding company is based in the UK but it, in turn, owes money to other parts of the Virgin business, whose ultimate parent company is in the British Virgin Islands. This type of corporate set-up has potential for reducing or eliminating the tax liabilities of operating companies; a company in the UK could always report a loss due to loan repayments to sister companies thereby never having to pay tax. Virgin Care refute suggestions that the company will not pay tax at some point in the future. 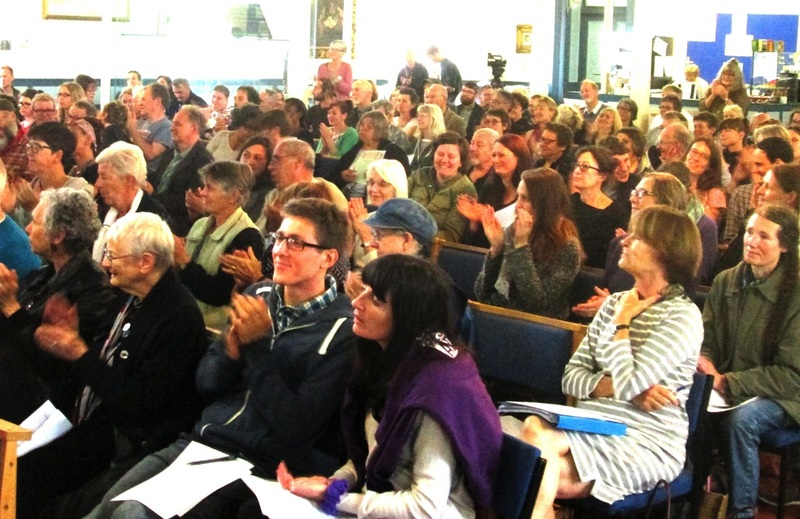 A capacity crowd filled St. Georges Church on Thursday evening this week at a rally organised by Sussex Defend the NHS. 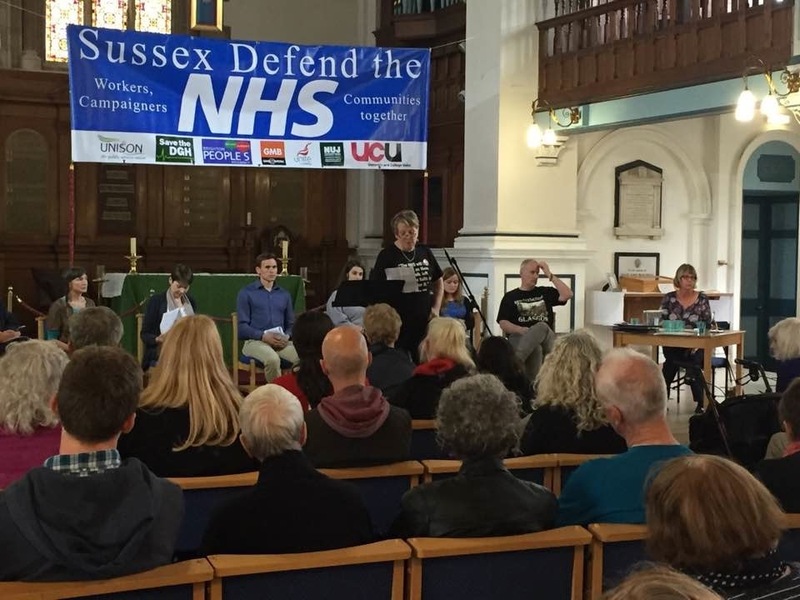 More than 200 people were inspired by a string of speakers recounting what has happened to the NHS across the city and Sussex as a result of the present government’s policies. Madeleine Dickens, introducing, argued that as the 5th richest country in the world, we can afford our NHS; we own it. And yet under this government what we have is underfunded A&E departments and hospitals, GP surgeries closing; waiting lists lengthening; treatments being rationed; NHS staff dealing with pay cuts, increased workloads, poorer terms and conditions; consultancy admin and legal costs escalating; PFI debts and budget deficits rocketing... and across every English region, the biggest attack on the NHS we have never heard of, the final nail in the NHS coffin – the Sustainability and Transformation Plan (STP)*. An impressive and impassioned line-up of speakers gave witness to the attacks on the NHS locally as well as nationally: Charles Harrity, GMB Senior Organiser for B&H City Council spoke of the Patient Transport shambles; Zoe Adler, intensive care nurse at the Royal Sussex spoke for Doctors of the World operating in Brighton for migrants and refugees; Stephen McClean, mental health nurse; Mitch Alexander from the Save the Willows campaign in Bevendean; Danielle Tiplady, student nurse from the national Bursaries or Bust campaign that has accumulated over 100,000 petition signatures; Todd Leckie, BMA junior doctor representative from RSCH and Caroline Lucas, MP who will be proposing a cross-party NHS Reinstatement Bill with support from the Labour Party. The second half of the evening was devoted to what can be done to halt the destructive policies being implemented locally as well as joining national campaigns of which Sussex Defend are a significant part. The audience heard from Joanne Land, herself one of the ‘Darlo Mums’ who last year reprised the Jarrow March from Darlington to London to raise awareness and protest for the NHS and now working within the Labour Party for a public NHS; Dr. Carl Walker who has started the Brighton Citizen Health Surveys; Richard from the Solidarity Federation on campaigning together with other workers; Mike Campbell, organiser of Protect Our NHS Bristol and Vicky Penner from the highly successful Save Lewisham Hospital Campaign. Ideas for protest and action came thick and fast and the meeting ended with loud enthusiasm and planning across communities for the coming weeks and months. Local commissioners and regional health quangos can expect some creative and difficult challenges ahead. Optum (US United Health) now controls GP hospital referrals; the privatised Patient Transport Services is in chaos; The Practice (private GP chain) pulling out because there’s not enough profit, leaving 10,000 patients without a GP; dedicated mental health wards have closed. And today, Children's and Young People’s NHS services are being put out to tender, Health Visitors are being replaced by cheaper nursery nurses and services for teenage parents axed. 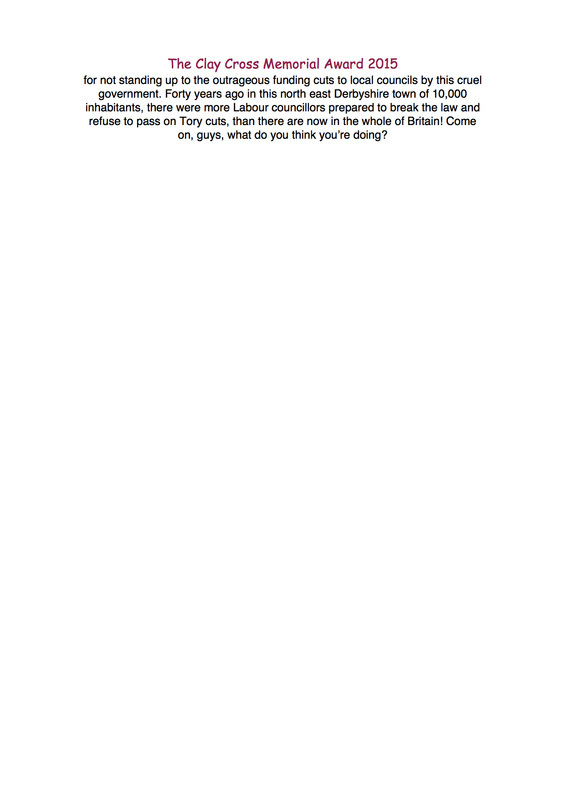 Hovering to bid for the contact is Virgin Health - well known for their tax-avoiding practices. It’s going to be 10,000 by Monday! Sussex Defend the NHS’s online petition, Stop this Shambolic Sussex Ambulance privatisation, is about to crack the 10,000 signatures barrier this weekend - and still those responsible stay silent. The commissioners who signed up to the new contract have ‘launched a formal investigation’ which is to report by mid-June. Apparently this is what constitutes ‘taking this situation very seriously’. Well, Sussex Defend say, 10,000 people across West and East Sussex are also taking it very seriously and are calling for the service to be re-contracted with SECambs - and not just for a ‘managed service’ which involves a whole bunch of sub-contracted transport. It’s now 6 weeks since this management company took over the service and still patients are waiting for hours to be picked up. A junior doctor told us last week how she had phoned from the hospital as she always does for patient transport, in this case for a mental health patient, only to be told, ‘We don’t take mental health patients now.’ Another doctor has said that some patients are arriving so late that they had to stay in overnight because they couldn’t get home. It’s not just patients suffering but doctors struggling to cope. We’ve heard that tomorrow, Saturday 7th, Brighton & Hove CCG have a stall booked in New Road promoting public health*. Sussex Defend hope to be there too with leaflets about what’s really happening to health services across the city. It’s going to be packed because of the lovely Children's’ Parade. So far our commissioners are refusing to come on the radio or tell the public what’s happening so it’s a good opportunity for press and media to ask them! And further news about the petition coming next week. * We won’t be having our stall as we couldn’t afford the fee in Fringe City! This time it will be even bigger: the government is trying to bully our Junior Doctors by imposing a new contract which all evidence shows is unsafe and unfair. Other NHS workers and their patients are already paying the price for new contracts - reduced staffing, worse hours, service cuts - all imposed through outsourcing and privatisation. You’ve only got to look at what’s happened to our Patient Transport Service across Sussex and our Referral Management System which is delaying treatment and causing distress to hundreds of waiting patients. Junior doctors will not give in to this bullying government and work in unsafe or dangerous conditions for patients and we must all support them in their fight. Junior doctors are withdrawing all labour for 18 hours from 8am - 5pm on Tuesday 26th and Wednesday 27th April. They are fighting for our NHS; we all need to show our solidarity with them. This week Unison is holding it’s Health Conference at the Brighton Centre. Delegates will be encouraged to march with junior doctors, other health workers, student medics, council workers, trade unionists, pensioners and campaigners 0800 from the Brighton Centre. The march will go up West St, into North St to the Old Steine then up Edward St and Eastern Road to the Royal Sussex County Hospital (arriving about 0900). There’ll be a samba band to join the noise. A rally will hear from speakers and it is hoped Dave Prentiss the General Secretary of Unison, one of the biggest trade unions in the country will join them. The BMA banner will head up the march followed by Sussex Defend the NHS, Trade Union banners to the fore and as many placards and as much noise as we can make. Please come down and support us - we need as much publicity as possible and for as many people as possible to know about what’s happening to our NHS. Usual contacts for interviews, photos and filming. See you down there! P.S. We are expecting at least 200+ on the march this time. If the crowd proves too big, we’ll be relocating the rally and speakers to St. George’s Church garden rather than outside the hospital. New Cartoon for Sussex Defend the NHS to use on all their leaflets, posters and banners. Local artist Nic Watts, drew the cartoon for free as a contribution to the campaigning efforts of the organisation which he firmly supports. Local campaign group Sussex Defend the NHS have just received the final version of a fantastic cartoon to use on all their leaflets, posters and banners. Local artist Nic Watts, drew the cartoon for free as a contribution to the campaigning efforts of the organisation which he firmly supports. Amongst his clients, Nic has drawn for government departments, Michael Rosen, the children's author, and many well-known publishers. Sussex Defend are thrilled to have Nic’s work making their Save the NHS message loud and clear. Patients and campaigners are anxiously waiting to hear whether their surgeries will close or be reprieved at a meeting with NHS England this coming Monday. Patient representatives have been invited to the meeting to hear recommendations for the future of the 5 Brighton & Hove surgeries that are threatened with closure at the end of September. Everyone is asked to come along and join the patients on the march on Monday. And please sign the petition for Save The Willows at https://you.38degrees.org.uk/petitions/save-the-willows-gp-surgery-from-closure. https://you.38degrees.org.uk/p/patienttransport. Everyone is urged to sign it. Conditions of work have been severely disrupted by the change in management to the private contractor Coperformer, leaving many drivers, communications operators and other workers very distressed. Press reports locally and nationally have been full of dreadful patient experiences making those in the front line very angry. So many patients have become stuck at the Royal Sussex County hospital in Brighton because their transport has not arrived that it has paid for taxis and other private vehicle suppliers to take them home. Staff there have had to stay until midnight to ensure kidney patients arriving hours after their scheduled start time have received their vital dialysis. Patients, relatives, NHS bodies, Trade Unions and local MPs have severely criticised the service’s performance but still local CCGs persist with the untenable private company. Ambulance drivers themselves have said the company is ‘out of its depth’. We should remember that the previous public provider regularly had approval ratings of over 90%. We have recently learned of the government’s plans for reorganising health and social care services. The whole of England has been divided into 44 regions known as Sustainability and Transformation Footprints. Each Footprint is to take over responsibility for provision through commissioning of health and social care services. Brighton & Hove Clinical Commissioning Group, the Council, the NHS Trusts that provide our health services in the city and the Trust that runs the Royal Sussex County hospital in Brighton will all become part of Sussex and East Surrey Footprint. These organisations will have responsibility for health and social care in their region so to all intents and purposes, remove the ‘national’ from our health service. The purchasing of services, new contracts for heath and social care services will be funded through this new organisation. 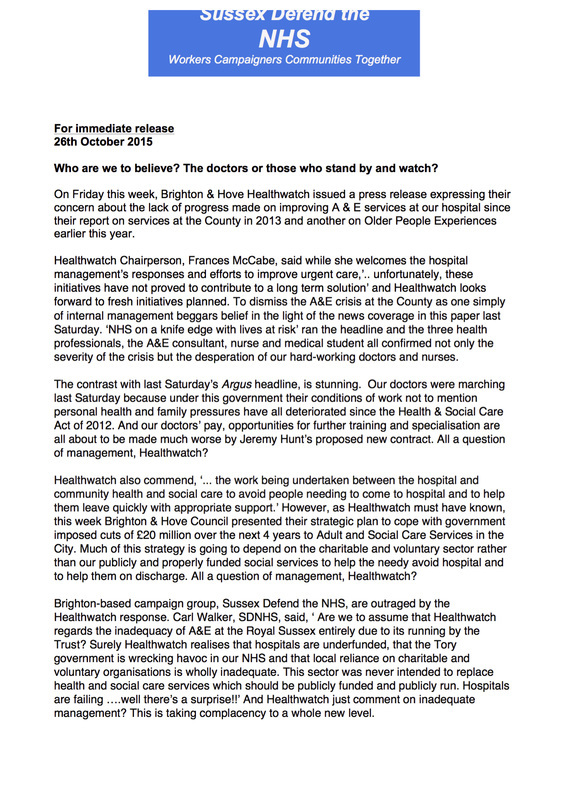 It is evident that the role of local elected councillors will be diminished and the voice of citizens across Brighton & Hove will become increasingly removed from the decision-making about our health and social care services, whatever the new authority may claim about patient and public involvement. “We have serious concerns about the pace with which this plan is being bulldozed through. Massive change is being proposed in how NHS services that we all rely on will be planned and commissioned. While different parts of the NHS working closer together is something that most people would celebrate, it has to be done with patients at the forefront. In fact, how we as patients are involved in decisions is a core principle of the NHS. “However despite the massive changes, no real discussion has happened and the Health & Wellbeing Board has been completely side-lined. This so called devolution is nothing of the sort, it is simply another ill-advised top-down reorganisation of the NHS with yet unknown consequences. “Together with the Health and Social Care Act 2013, these new STPs could signal the permanent break-up of the NHS. As budgets are increasingly devolved, we will be forced to pick up massive deficits which are the legacy of chronic underinvestment in our hospitals. These could have a devastating impact on healthcare in the city and be used to justify further unwanted privatisation”. The recent survey of Brighton citizens about our health services showed very strong support in Brighton & Hove for a publicly funded, publicly run NHS. Many respondents to the survey questions, showed serious concern for those local services which have been sold to private companies not only in principle but also in practice - the referral management system in chaos and the patient transport disaster are just two cases in point. Anyone concerned about these changes can attend the special meeting of the Council’s Health & Wellbeing Board on Tuesday 19th April, 3pm in Portslade Town Hall, Victoria Road, BN41 15D. Sussex Defend the NHS are setting up a Public Meeting to hear about the new Footprints and discuss the consequences. Details will be on their website at www.defendthenhssussex.weebly.com very soon. Everyone is welcome. Is this the end of our NHS? Is more health service chaos on its way? 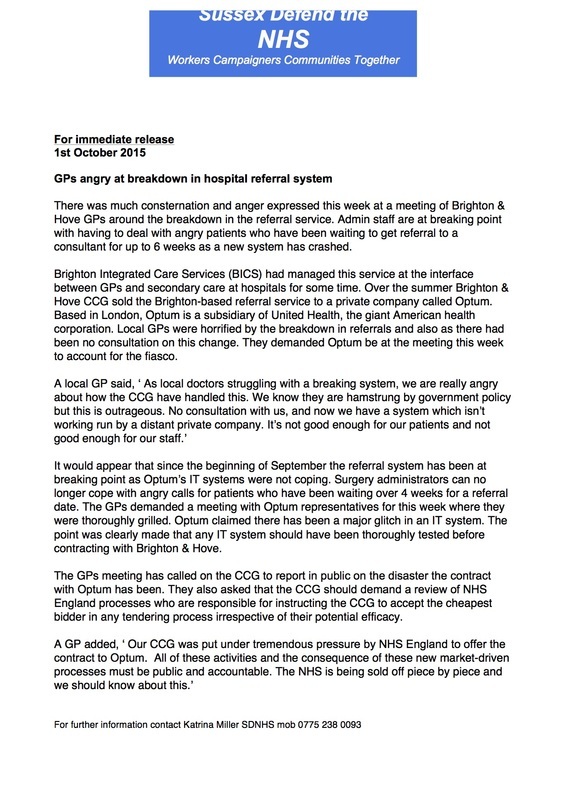 Chaos in our Patient Transport System and chaos in the Brighton & Hove Patient Referral Management System, closure of 4 GP surgeries: it would appear this recent record of disaster in our health services is not likely to end soon. In fact, it may be about to get a whole lot worse. The ‘national’ is about to be finally wiped from what remains of our NHS as NHS England, the bosses of our local commissioners (CCG) step up their breaking up of health services into 44 regions. In essence, these Sustainability and Transformation regions or ‘footprints’ will be responsible for the financing of all our local health and social care services. Their income from the government is to be dependent on achieving specific outcomes and on keeping finances in balance. And it’s the second of these ‘must do’s’ that means, in reality, massive cuts to reduce NHS spending; ‘a balanced budget’ means that any existing deficits will have to be absorbed. Brighton & Sussex Universities Hospital Trust, for instance, recently announced it’s debt total at a staggering £37 million. Will this be absorbed? How can this be done without selling NHS assets smaller hospitals and specialist units currently in the NHS, severe cuts to frontline services or the awarding of every new contract to the lowest bidder? Our local footprint has Brighton & Hove with East Sussex, West Sussex and East Surrey. Sussex and East Surrey Footprint staff have been working on the Plan showing how the ‘must do’s’ will be achieved. The first Short Report is due for submission to NHS England today. But has anyone seen it? NHS England say planning should, ‘ engage patients, staff and communities from the start, developing priorities through the eyes of those who use and pay for the NHS’. There doesn’t appear to be much evidence of that yet. Sussex Defend the NHS say what NHS England are doing is a massive, duplicitous and potentially disastrous break-up of the NHS. NHS England is accelerating both the privatisation of the NHS and the loss of its national character by extending the devolution agenda throughout the English health service with no democratic mandate whatsoever. As the University of Brighton’s recent Citizens’ Health Survey has shown, there is no support for the breaking up and selling off of the NHS in the city. And there will be increasing concern over the lack of democratic participation in governance in the new organisation or the next stage of planning. A special meeting of the Council’s Health & Wellbeing Board will take place next Tuesday, 19th April at 4pm at Ronuk Hall, Portslade. Sustainability and Transformation developments are to be discussed as is also the crisis in the Patient Transport Service. The meeting is open to the public as usual. Once again our Junior Doctors are on strike for 48 hours. They will walk out after the night shift from 8am Wed 6th April for 48hrs until 8am on Friday 8th. The BMA have said that since they have given employers much more than the required 7 days’ notice of this action, it is the responsibility of the employer to ensure a service is provided. A demonstration of support for the junior doctors and the NHS will gather in St. Bartholomew’s Square at 0800 on Wednesday 6th and march up to the Royal Sussex to join the picket lines and rally. There will be banners, noise and speeches at RSCH and Brighton Trades Council will be making this year’s presentation of the Kent Miners’ Lamp to the junior doctors for their fantastic campaign in defence of our NHS. Other NHS workers and their patients are already paying the price for new contracts, reduced staffing, worse hours and service cuts imposed through outsourcing and privatisation - waiting lists are lengthening, GPs surgeries closing, the referral management system in Brighton & Hove is in chaos. Andy Richards, Chair of the Trades Council added, ‘We need to support the doctors as part of the fight to defend our NHS. This dispute cannot be seen in isolation from the attempts by the Tories to privatise and commercialise it’. Sussex Defend the NHS as always support the junior doctors in their fight and will have a noisy presence on the march and rally. Please come along and join us for photos, filming and interviews. The recent news that The Willows Surgery in Lower Bevendean, along with 4 others in the City, is to close has been greeted with consternation by local people and councillors in the community. The 5 surgeries are under threat of closure due to the withdrawal by The Practice Group, a private primary care business, from their contract with NHS England. On Tuesday, NHS England met with Brighton & Hove CCG, Community Development Officers from the areas affected, the Council’s Health & Wellbeing Board and others to assess the impact of this contract termination on the 11,500 patients who will be affected, including the 2,000+ from Bevendean. No patients were at the meeting and although concerns were reported by the Community Development Officers, the Bevendean campaigners were furious that they were denied direct access to the commissioners. A spokesperson for Sussex Defend the NHS said, ‘ It’s outrageous that patients are excluded from the discussions on their NHS services. Replacing real local people with Community Development Agency workers who to all intents and purposes are employed by the commissioners is entirely undemocratic. NHS England, CCG, whoever, stop pretending you’re listening to people, because you’re not. And this is neither what people want nor what we deserve’. 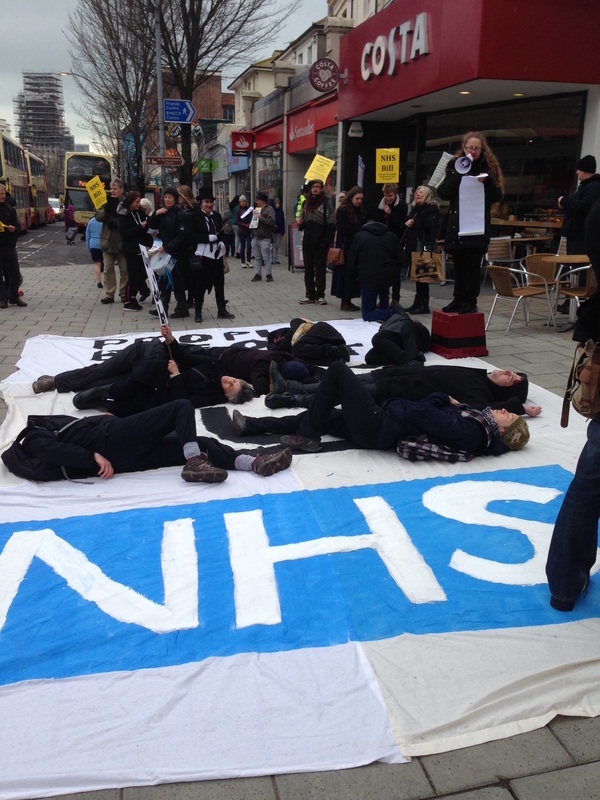 Despite a chill wind today, campaigners from Sussex Defend the NHS this morning staged a ‘die-in’ around Brighton and gave out over 2000 leaflets telling shoppers about the crisis that is hitting our NHS. From the junior doctors striking to save the NHS and fight the imposition of an unsafe contract, local GP surgeries threatened with closure, the withdrawal of student nurse bursaries and concern over contracting local ambulance services to the private sector, the action was a timely one in the city. A group of about 40 gathered at the Clock Tower in Brighton and proceeded to Churchill Square where, dressed mainly in black, some ‘died’ to represent the dying national health services while ‘Dr Death’ and ‘Nurse Hero’ presented the facts about the running down, breaking up and selling off of our health services both nationally and locally. With their colourful placards the group then moved on to Ship Street and New Road before a spontaneous performance in Sydney Street and a finish in London Road. There was a lot of support evident from passers by. One said,’ It’s so important what they are doing. This is very serious and it’s something that affects us all.’ Another shopper said how much she admired what the group were doing. Students from the medical school and universities have started a group Sussex and Brighton Students for the NHS. They have produced a spectacular banner which attracted a lot of attention and was used as an impromptu stage area for those ‘dying’. The focus of the street performances was the NHS Bill which, sponsored by Caroline Lucas and Jeremy Corbyn, has its 2nd reading in the House of Commons this coming Friday. The Bill aims to halt the market operating within the NHS, reinstate the service as a publicly owned, managed, funded and provided public service. Sussex defend the NHS are planning a Big Send-Off for the Brighton Pavilion MP as she leaves for parliament on Friday morning and all are welcome to come along 07:40 - 08:15 on 11th. On Saturday 5th March Sussex Defend the NHS are putting on a bit of street theatre to draw everyone’s attention to the crisis in the NHS. We have organised this event because junior doctors are striking, GP practices closing, Royal Sussex is in the red to millions of pounds, students nurses and midwives are losing their bursaries, our ambulance service is going into private hands: the NHS is being systematically broken apart and destroyed. We are being pushed towards a US insurance-based system, private companies profiting while patients are left waiting or without a GP, staff are exploited and standards of care deteriorate. The Tories are wrecking our NHS. Don’t let them get away with it! They’re starving our NHS to death for a corporate fire sale! To do that we have to push the government to change the law. The NHS Bill next Friday is due to receive its 2nd Reading. The Bill proposes a restoration of our NHS as a publicly owned, publicly provided, publicly funded, democratically accountable national health service. This is what was intended, what we expect and what we all pay for throughout our working lives so that we get the healthcare we need when we need it and no more to pay. End the market in the NHS! It’s costing billions and proving wholly inadequate! 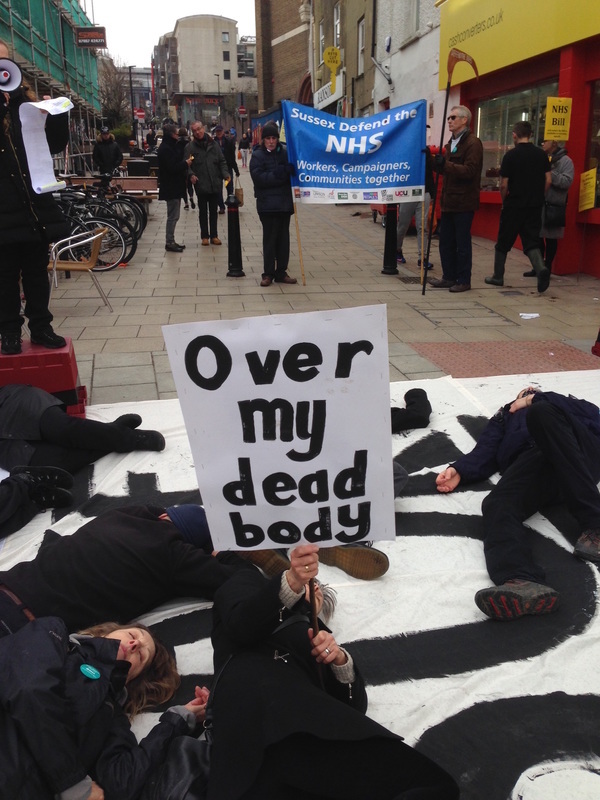 At 11:00 outside Churchill Square in Brighton, there’ll be a symbolic ‘dying for the dying NHS’ with ‘Dr. Death’ and local ‘Nurse Hero’ arguing the case. There’ll be drums and noise, leaflets and placards. Then we move to 2 other sites in the City spreading the word about the NHS Bill and the campaign as we go. We hope you’ll come along for pictures, film and interviews. the state of the NHS is of grave concern to us all and Brighton & Hove need to know! For the first time in 40 years, medical professionals from doctors to nurses, midwives and health specialists are in dispute with the government about the management of their working lives, their conditions of work, their training opportunities and their pay. They have, through their professional associations, been discussing these important issues with the government and NHS management since 2012. No public sector worker wants to strike. But Jeremy Hunt and the government are refusing to acknowledge the evidence before them that what they are trying to impose on hospital and clinical staff is unsafe and downright dangerous. What is more worrying is that we are not being given the full story and indeed much of our media is reporting the government story and not that of the professionals. Sussex Defend the NHS invite everyone to come along to a Public Meeting on Thursday this week, February 11th to hear, ask questions and discuss the issues with doctors, nurses and health professionals, their unions and well-informed campaigners. The meeting takes place upstairs at The Eagle, 125 Gloucester Road, Brighton in the North Laine just down from Sydney Street 7pm - 9pm. Please come along! Defend our NHS! Defend our Education! You can ask questions and join the discussion. It’s OUR NHS and patients, doctors, health care staff need to work together to save it. The government plans to scrap bursaries and make nurses, midwives, occupational therapists, physios and other health professionals pay for their entire training: a debt for each of them of £51,000. That’s unjust – nurses spend 50% of their training time working for hospitals or clinics and starting salaries are only £22,800. It will cause another recruitment crisis and that’s dangerous – staffing levels are already way below recommended levels. NHS Students (including student nurses), Medical students and Junior Doctors are the Future of the NHS. We have already seen, for the first time in forty years, our hospital doctors forced to take strike action as the government tries to impose an unsafe and unfair new contract on the junior doctors. Last Saturday saw yet another huge demonstration in London against the government’s proposed new contracts. This time it was supported by other health professionals as well as student nurses and midwives angry at George Osborne’s proposal to cut the NHS student bursary. Wednesday, 10th February our local hospital junior doctors join the national strike action providing only emergency care for 24hrs commencing at 08:00. As last time, later on Wednesday afternoon there will be a ‘Meet the Doctors’ event in town from 14:00. Subject to Council permission it will take place in New Road and involve general discussion, engaging the public and handing out leaflets explaining the dispute. In Haywards Heath, there is hoped to be a picket again from 0800 - 1200 at the Princess Royal and Mill View Hospital in Hove will also have a picket presence at the same time. Sussex Defend the NHS will be supporting all the actions and welcome all who want to come along. Katrina Miller, from the campaign group said, ‘We’re still here. And we’ll be here doing what we can as long as Jeremy Hunt and this government keep on trying to destroy our NHS. I really feel for these doctors and the students too. This strike action is not easy. It really is a last resort but how else can we all make the government listen. I hope loads of people will come and join in and talk to the doctors in New Rd. We’ve also organised a Public Meeting for Thursday so come along if you can. It’s Thursday 11 Feb. NHS Students and Junior Doctors: the impact of no bursary and unsafe contracts. 7-9pm The Eagle Pub, Brighton (just down from Sydney Street in the North Laine). Brighton-based campaign group Sussex Defend the NHS is leaving no stone unturned in its efforts to stop and reverse NHS cuts and sell offs that are decimating the City’s health services - another 5 GPs surgeries to close, Substance Misuse Service sold, half of new Royal Sussex County hospital beds allowed to be private. ask her whether and how key Labour NHS policies will support the campaigners in their drive to stop and reverse NHS cuts and privatisation. On behalf of Sussex Defend the NHS group from Brighton, three campaigners attended the meeting, to outline their campaign exposing Brighton & Hove Council, the Director of Public Health and the city CCG’s failure to protect the Substance Misuse Service (SMS), specialist staff and, specifically, the detox beds that are now closing in Hove and Crawley. The three campaigners, all health professionals themselves, introduced the experience of SMS in Brighton & Hove as a case study demonstrating the ‘extinction’ of NHS-based Substance Misuse services with a full-on shift away from the NHS to the voluntary and social enterprise sector. The consequences for SMS staff in B&H reflect what is happening in the wider NHS community as services are hived off from the NHS at an ever-accelerating rate. They were asking the Shadow Health Secretary to explain where she and the Labour Party stand on key NHS campaign demands. The key question from the campaign groups was whether the Shadow Home Secretary supports the NHS Reinstatement Bill, to renationalise the NHS. The NHS Reinstatement Bill, originally proposed by Brighton Pavilion Green MP Caroline Lucas, is due for its second reading in the House of Commons on Friday March 11th. The Bill proposes to reverse the horrendous changes to the NHS which the government is undertaking and to reinstate the NHS as a publicly funded health service. The Bill has so far been backed by Jeremy Corbyn, John McDonnell and over 60 Labour MPs. Ms. Alexander is to meet with Dr Allyson Pollock one of the initiators of the NHS Bill, something which SDNHS hope will strengthen Labour Party commitment to supporting the Bill. and all are invited to have your say. In the recent article detailing the retirement of Brighton & Hove’s Director of Public Health, Dr. Tom Scanlon (07/01/16), there appeared a number of glowing tributes to Dr. Scanlon, praising his achievements during his tenure. 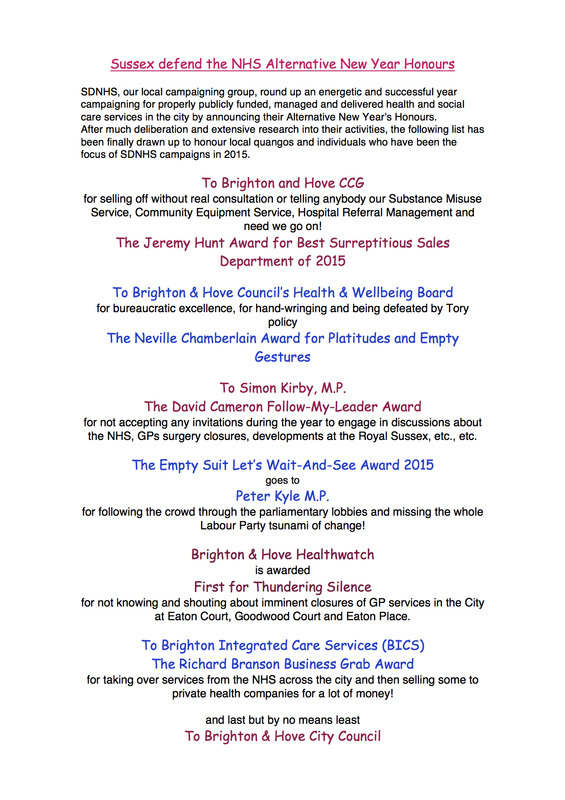 We, Sussex Defend the NHS, note however that absent from the eulogies was his disastrous role last year in transferring Brighton & Hove’s Substance Misuse Service from the local mental health trust to Cranstoun’s, a third sector provider. Not content with insulting the entire workforce by labelling them as “without ambition” at the Policy and Resources Committee meeting in September 2014, Dr. Scanlon (along with erstwhile council leader Jason Kitcat) insisted on removing the service from local control. The net result of this decision was that 14 highly experienced NHS substance misuse nurses who had spent many years building therapeutic relationships with a hugely vulnerable clientele have now left the service. Staff who transferred over are now compelled to carry uncapped, ever increasing caseloads. The award winning Substance Misuse Social Work Team are now reduced and relocated away from substance misuse services. As if this wasn’t bad enough, Sussex Partnership NHS Trust announced last week that it is closing both of its in-patient substance misuse wards. The trust cited the loss of funding attached to the community service. This loss of funding means that it is no longer financially viable to keep in-patient facilities open. We now face the absolutely ludicrous situation where a city that regularly tops the league table of drug related deaths per capita, no longer has in-patient facilities to offer treatment to those addicted to illicit drugs and alcohol. Alcohol abuse is estimated to cost Brighton & Hove one hundred and seventeen million pounds per year (Argus 22/02/13). Further money will now need to be spent commissioning out-of-area beds that will not only involve further expense but mean that patients are frequently treated many miles away from their homes, families and support networks. The council’s 2016 “Statement of Licensing Policy” states that ”alcohol related death rates are twice the national average in Brighton and Hove” and yet there will no longer be an in-patient detox unit within the City. David Cameron repeatedly tells us that the Health & Social Care Act is about removing control from the bureaucrats and placing clinical decision making in the hands of clinicians. If those now making these decisions, including the Director of Public Health, CCG and councillors on the Health & Wellbeing Board, cannot undertake proper impact assessment on the whole health economy in these re-contracting situations, then they are not fit for function. The Director of Public Health chairs Brighton & Hove’s Alcohol Programme Board; the remit for the Director of Public Health includes responsibility for alcohol and drug misuse services. Dr. Scanlon, as Director of Public Health, was warned time and time again about the risks in fragmenting and outsourcing local NHS services but hubristically chose to ignore not only the views of the specialist and experienced workers themselves but also a specific petition against the transfer signed by fifteen hundred residents of Brighton & Hove. The current crisis in our Substance Misuse Service and a further 25% cut on the horizon, the loss of a skilled workforce and the loss of in-patient beds should be regarded as Dr. Scanlon's true legacy. pp Sussex Defend the NHS. Last month saw a massive demonstration by junior doctors, healthworkers and the public expressing anger at the government’s attempt to impose an unsafe and unfair new contract on our doctors. Strike plans were put on hold when finally the government agreed to talks at ACAS. These have now ground to a halt as the BMA accused the government of ‘intransigence’ and of not committing to serious negotiation. Next Tuesday, 12th January, will see our local hospital junior doctors join the national strike action providing only emergency care for 24hrs commencing at 08:00. Todd Leckie, local BMA representative at RSCH says that there will be a demonstration outside RSCH in Brighton from 07:00 until 12:00 followed by a rally and events planned in the city centre. It is clear from these that Lucas’s statement is fully in support of the Junior Doctors and specifically of the NHS . That is the same view as Sussex Defend the NHS, Medsin and members of the public who Defend has spoken with in the last two weeks. However what is surprising are the remarkable similarities between Kyle and Kirby statements. They do not support the Drs directly. We leave it up to the readers to conclude why this is so and to challenge these two MPs in writing or when they meet with them. I am sorry that I cannot be at the meeting with you tonight but I wanted to send this message of solidarity. I am right behind you. I know from meeting more than 40 junior doctors at one of my recent surgeries that no junior doctor is considering strike action lightly. Junior Doctors fear that Jeremy Hunt’s planned changes to contracts will harm our NHS. They are right: the changes are an attack on staff and will make patients less safe. If the Secretary of State will not listen, then drastic action, including strike action, has to be considered for the sake of both patients and our junior doctors. The Government seems intent on blaming NHS staff for problems, instead of admitting their own responsibility to give our public services proper support and funding. This seems totally counterproductive, not to mention unfair. After my meeting with local doctors I tabled Early Day Motion 539, which has now attracted the support of over 100 Members of Parliament. The motion formally recognises that junior doctors are dedicated professionals who are the backbone of the NHS, providing the best quality care for their patients, and that junior doctors already work seven days a week. It calls for an end to the imposition of preconditions prior to negotiations and for the Health Secretary to bring an evidence-based approach to this issue - something that has eluded him, so far. If the junior doctors vote to strike when the votes are counted on 18 November, I will back them, because I know that they are dedicated and I know that they have patient safety at the very heart of their concerns. If they do not strike, the fight will continue and I will still do all I can to try and stop the policies of the Secretary of State and his ilk from undermining our NHS and its hard working, dedicated doctors and other staff. On a personal level, I really appreciate the vital role junior doctors play in our NHS and their tireless work in our hospitals, a view I know that is shared right across the Labour party. Labour's Shadow Health Secretary, Heidi Alexander, has called for Jeremy Hunt to withdraw his threat to impose the new contract on Junior Doctors and I fully support her position on this. It is simply wrong for Jeremy Hunt to be 'taking on' the profession in this way - he should instead listen to the legitimate concerns that have been raised across the Health sector. Indeed as we saw last month, former Tory Health Minister, Dr Daniel Poulter, has himself criticised Jeremy Hunt for causing the understandable anger felt by junior doctors by reneging on previous proposals put forward. Rest assured, I will continue to support all efforts to get the Government to re-engage in a dialogue with the BMA and put forward a deal that safeguards both staff and patient safety. I recognise that the issue of the junior doctors’ contract is something that local residents feel strongly about. I agree that junior doctors do an incredible job every day of the week looking after our friends and loved ones. We are currently in the middle of the ballot period, however, whatever the result, I would urge both sides to sit around the table to resolve this important issue and hope strike action will not be necessary. We all want to see the very best patient care in our NHS and it is important that a fair solution to this dispute is found as soon as possible. We are in the argus. Contacts meetings with Argus, Brighton Indy and Latest. Also good meeting with Brighton Journalist Works for trainee journalists. Local tv to be contacted next. BBC Sussex & Surrey Radio Neil Pringle Breakfast Show Top of news on same radio Top story BBC South East after national news 0800 onwards. Is it Safe? Is it Fair? St. Mary’s Church, Upper Rock Gardens. Last month saw a massive demonstration by junior doctors, healthworkers and the public expressing anger at the government’s attempt to impose an unsafe and unfair new contract on our doctors. A big, colourful and noisy contingent went from Brighton supported by our local campaign group. This Thursday, Sussex Defend the NHS and our local BSMS students are organising a Public Forum to hear the case for the doctors and the future of our NHS. All are welcome. As well as Dr. Galloway, also speaking will be an RSCH Junior Doctor and BMA representative, a former A&E and currently Dual Diagnosis nurse and a local mental health nurse. All press and media are invited to come along. This is expected to be a significant event both locally in Brighton & Hove and also given the strike ballot context, national attention. Who are we to believe? The doctors or those who stand by and watch? Healthwatch only stands by and watches part of the story. GPs angry at breakdown in hospital referral system.